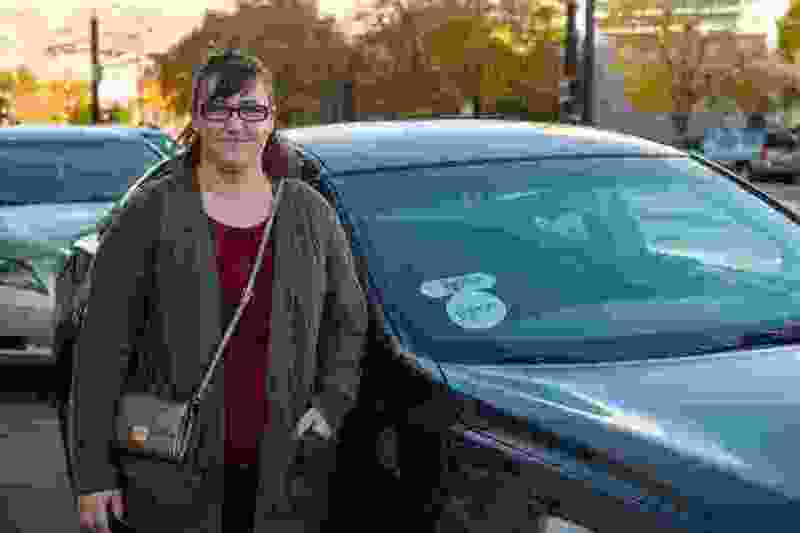 (Rachel Molenda | The Salt Lake Tribune) Natalie Fleming, pictured in front of the Tribune office on Oct. 26, 2018, drives for rideshare companies in addition to working a full-time job. When she’s finished for the day at her accounting job, Natalie Fleming fills up her car with gas and turns on the Uber and Lyft apps on her phone to signify that she’s ready to take riders. Her full-time job pays well, the 26-year-old said, but she drives about 20 hours a week — plus hours spent doing the back-end accounting for a business she’s starting with a friend — as a way to make extra money and to pay rent and various debts. Fleming is part of the nearly 1 in 4 Americans that a 2016 Pew Research Center survey found now earns money from a side hustle, in which workers take on jobs from various companies in addition to — or rather than — working full time for a traditional employer. Some seek the extra jobs out of a desire for flexibility or as a way to socialize or pursue their passions, according to Steve King, a partner at Emergent Research, a California-based organization that studies the future of work. But many take on the tasks out of necessity. The economy generally has a good bill of health, King said. But as wages have stagnated after the Great Recession, costs have gone up across the country for housing, education, health care and health insurance much faster than the overall inflation rate — putting a lot of pressure on household incomes. Even working a full-time job and two side hustles, Fleming said she sometimes has trouble making ends meet, particularly as Utah faces an affordable-housing crunch. She lives in Centerville but plans to move into an RV in a few months, so she can save some extra money to buy a house. “I don’t even have as many student loan debts as some of my other friends — I know friends that have $80,000 to $100,000, and I only have like $16,000 — and [I’m] still working multiple jobs just trying to make the student loan payments and be able to eat and to be able to just have housing,” she said. Working almost constantly can make it hard to achieve balance in her life and to see family and friends, Fleming said. And while the money makes a big difference in supplementing her income, it’s not always consistent — forcing her to sometimes “move around a few bills" to make it all work. But even with the challenges, Fleming said she’ll probably continue to work on the ride-hailing app after she pays off the majority of her debt in a few months, because she likes her passengers, the extra money and the flexibility of working when she wants to. There’s a perception that the gig economy is primarily made up of younger workers, but King said that isn’t true — though those people may make up a larger portion of the workforce on digital platforms. Still, King noted, economic forces are pushing more people toward the gig economy. Many of those are Americans 55 and up, an age group that is growing “quite rapidly” as those people go into retirement “ill-prepared financially," he said. People of color are also more likely to participate in the side-gig economy, King said. After Will Shiflett, 49, was laid off in February, he turned to the gig economy as a way to make money while he looked for a new job. Eight months later, he’s still searching. Shiflett, who has a master’s degree in public administration and two bachelor’s degrees, works part time as a political consultant, delivering pizzas and taking on odd jobs whenever he can. Laboring around 60 hours a week, he said he feels like he’s “constantly working.” But it’s still a struggle to make ends meet for his family on one income, he said, especially since his wife is unable to work due to health complications. “These are great jobs for people who want some extra cash,” said Shiflett, who lives in Sandy. “But the reality is, the majority of people who are occupying those positions are using them not for extra cash but for cash to actually live on. And I’m afraid that’s just not going to work out. It’s just a sign of very troubling times ahead." For Valentina Yingling, a full-time journalism student at Brigham Young University, working in the side-gig economy has been a more positive experience. She takes on the occasional acting gig and works a few hours a week for Instacart, a grocery delivery service. “You download an app, and then that’s where you can plan your hours, that’s where you can see what you’re earning,” said Yingling, 19. “They’ll send you to the store; they’ll tell you which store to go to. Once you get there, it will download the entire list of things, and you scan them as you go so you get the exact one and then, from there, it will navigate you to the person’s house." She works from six to seven hours a week and said that she likes the ability to choose her time around her school schedule — a flexibility more traditional jobs don’t offer — and that she’s not sitting in an office all day. “It’s a lot of fun because it’s superconvenient,” she said, though she noted again that the money isn’t consistent. Love them or hate them, King said, side gigs aren’t going away anytime soon. That’s because the economic forces leading people to seek extra work will remain. Digital platforms have made it easier for people to explore their passions, he said, and to learn new skills. But the fact that many are seeking side gigs out of financial necessity demonstrates a need to strengthen traditional employment, King said, whether that’s by boosting the minimum wage or by creating better social safety nets and protections against labor abuse. “There’s just a whole range of things I think we could do," he said, “to improve traditional employment that would take the pressure off of people to have to go get second jobs and work in the gig economy."